IV Conferencia Internacional de Ecolingüística (ICE-4) Lenguaje y eco-civilizaciones: hacia una conciliación con las Ciencias de la Vida. Universidad del Sur de Dinamarca (University of Southern Denmark, Odense Campus) del 12 al 15 de agosto de 2019. Agradecemos su difusión. 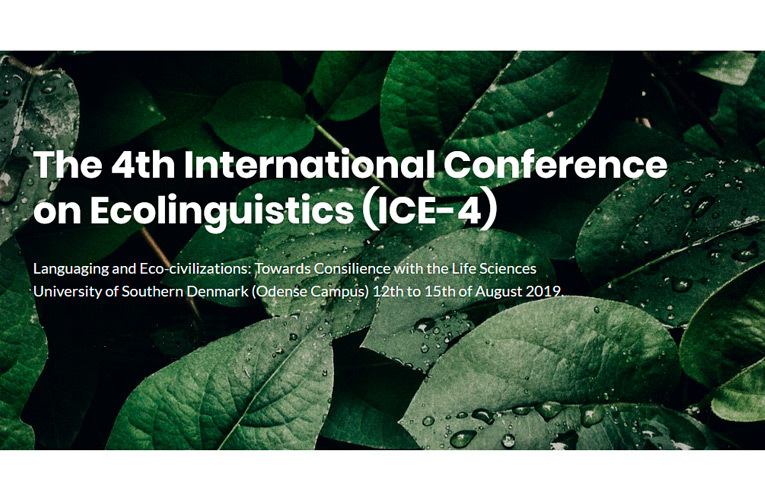 The 4th International Conference on Ecolinguistics addresses: Languaging and Eco-civilization: Towards Consilience with the Life Sciences. The conference aims to bring about consilience (a bringing forth of new knowledge) that can unite those who acknowledge human responsibility for the well-being of the living world. Accordingly, we aim to connect ecolinguists with work in fields that include bio-ethics, ecocriticism, biosemiotics, economics and the environmental sciences. Drawing on Eastern and Western thought, ecolinguistics is developing into a discipline built on a set of international conferences, a global network of ecolinguistic scholars, and a newly established journal and book series. ICE-4 extends how the previous three ICE conferences (held in Guangzhou, Beijing, and Guiyang) have linked ecolinguistics to the policy of building an ecological civilization based on Chinese characteristics. Thus, the conference will strive to construct new ways of drawing on languages and languaging to create sustainable eco-civilizations. Accordingly, ICE-4 will use a multidisciplinary context to connect old and new concerns with what linguistic expertise offers to the well-being of human and non-human forms of life. We pursue how linguists can contribute to managing a transition to new eco-civilizations. Looking beyond discourse, we appeal to how activity based on scientific, social and ethical concerns draws on linguistic expertise and skill. In so doing, we open up a transdisciplinary domain that aims to stem biological degradation and nurture a new concern for sustaining life on earth. 1. How do languages (especially threatened languages) shape well-being by drawing on a history of interdependency between humans and their lived environments? a. How can discourse about the environment and ecological issues be used to develop harmonious living within the bio-ecology by, for example, replacing the stories that underpin globalised culture with new ones. a. Raise awareness of human interdependence with the living world? b. Allow communities to harness the power of science while also recognizing its narrow epistemic limits? c. Pursue educational and communal ways of enhancing the well-being of local environments? We encourage submissions that address languaging and eco-civilizations from theoretical or empirical perspectives, or from those directed at community and educational practices aimed at re-establishing harmony within the bio-ecology. We seek participation from ecolinguistics, applied and general linguistics, ecological humanities, environmental science, economics, philosophy, cognitive science, semiotics, translation, communication, business, education and other related fields. Conference papers can be submitted either as an oral or a poster presentation. Paper abstracts (maximum 300 words) should be submitted by 1 February 2019. Speakers will be notified by 1 March 2019. Primary language of submission is English. For submission of abstracts and proposals, see guidelines on: www.ICE-4.dk.